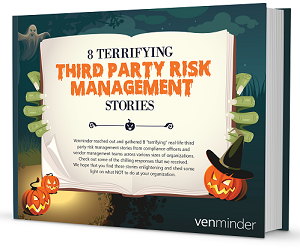 Venminder reached out and gathered 8 “terrifying” real-life third party risk management stories from compliance officers and vendor management teams across various sizes of organizations. Check out some of the frightening responses that we received along with key takeaways. We hope that you find these stories enlightening and that they shed some light on what NOT to do at your organization.